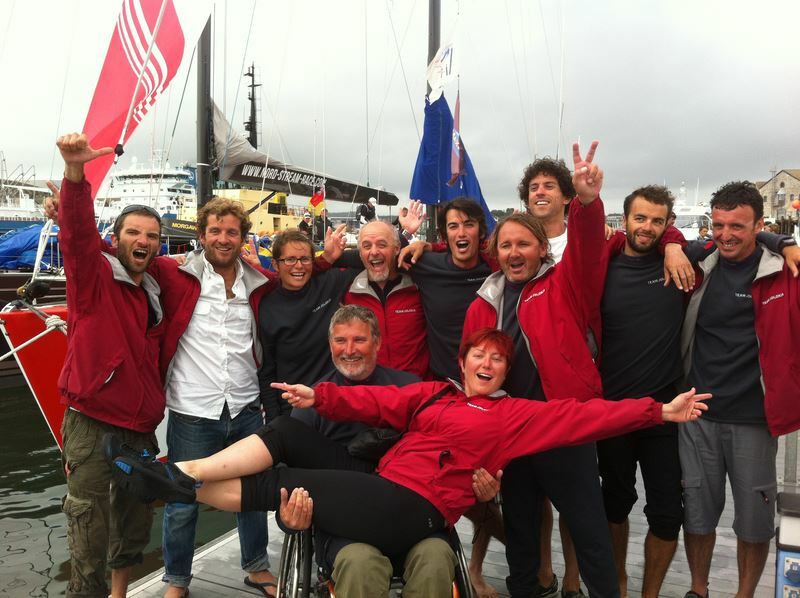 Team Jolokia on TV: Sailors like no Others! On February 1st, the French TV channel TF1 broadcast a special report named “Sailors like no others”*. The show was presented by well-known French television personality Claire Chazal and gives us a recap of the 2013 season for Team Jolokia: their crew selections and the Rolex Fastnet Race. Team Jolokia is a MaxSea partner, and this sailing team has recently been receiving increased media attention. This is due in part to the fact that this successful team comprises twenty-five people from different backgrounds, including seniors, young people, men, women, able-bodied or disabled. For more than 30 minutes, the camera recounts an intense year of emotion: Tour de Belle -Ile, Armen Race, Record SNSM, and finally the race of the year: the Rolex Fastnet Race! We are shown several moments experienced by the crew of novices, for better or for worse! The report also immerses us in the personal lives of these amateurs: envy, challenge or discovery, they reveal why they signed up for this unique adventure. We also see beautiful landscapes at sea and ashore. The crew shows us their desire to excel to achieve a common goal. This TV show can be viewed in French by clicking here. Well done, Team Jolokia on this great TV report! MaxSea’s partner Team Jolokia is committed to promoting diversity in their racing crew and they have enjoyed huge success over the last few years. This winter, Jolokia team’s big events are taking place primarily on land. Selections are being made for the 2014 crew and a TV report was broadcast on the French channel TF1 on Saturday February 1st. Team Jolokia is definitely continuing its momentum and starting the New Year with a bang! The first steps in the crew selection process took place in Paris on January 27th and more will be run on February 6th and 7th, followed by Lorient which is the home port of their vessel, in late February and early March. In the previous try-outs 130 candidates sent in applications during the 6 months following Jolokia’s ad. However, in the 2014 try-outs, between October and November 2013, they received 190 applications to be considered in the first phase of selection. The number of applications was a great success for the Team, as it continues to receive more and more support. Among all of these diverse and highly-motivated profiles, 45 were selected to participate in the second phase of selection. This group included 27 men and 18 women from all backgrounds, aged between 18 and 64, from all over France and into Germany, Poland and Spain. They all wanted to join the adventure of diversity that Team Jolokia offers. Sailing skills, team spirit, ability to share and commitment are all criteria used by Team Jolokia to make these selections. These qualities are desirable as they help enrich the whole team. Candidates met on January 27 at the premises of the Navy in Saint -Lazare. There, they took written tests on various topics such as weather, hydrodynamics, aerodynamics etc. This was followed by written psychological tests. The Navy is a loyal partner of our Team, and we use the expertise of their psychologists in the recruitment for extreme trades. 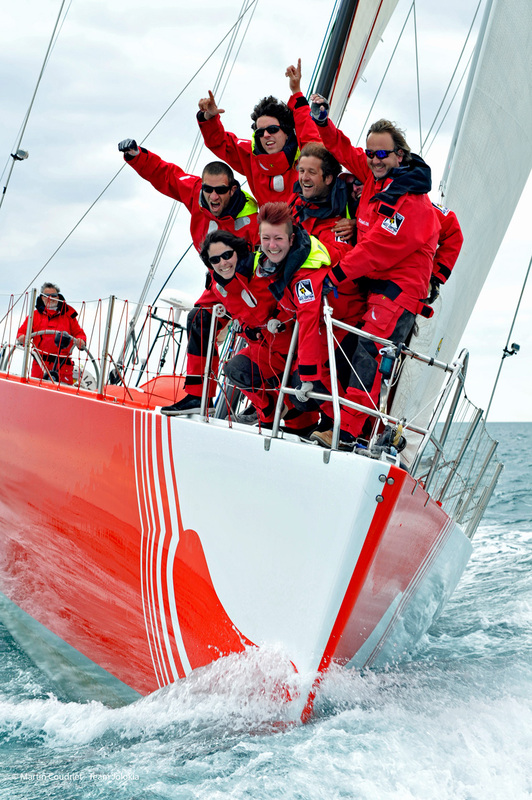 On February 6th and 7th, the Nautical club of Sèvres will welcome Team Jolokia for the second consecutive year. On the Programme: dinghy regattas between barges on the Seine and indoor physical and sports tests. To complete the day, motivational talks will be given by the organisers as well as psychological interviews with the Navy. The third phase of selections will be held in Lorient, home port of Team Jolokia’s boat: 3 days of navigating aboard the Volvo Ocean 60. Two sessions are planned to welcome the future teammates in late February and mid-March. At the end of the third phase, the crew will have 25 teammates in 2014: 17 new candidates and 8 of the 2013 crew will continue the adventure. .The Team Jolokia Adventure on Television! The report “Des Marins Pas Comme Les Autres” (“Sailors Like No Others”) recounts the 2013 season, selections of the crew leading up to the Rolex Fastnet Race. It was co-produced by GEDEON Programmes, Ushuaia TV and TF1, and runs for 32 mins. It was broadcast on French TV channel TF1 on Saturday, February 1 at 1:20pm, just after the news, in the magazine show “Reportages” presented by Claire Chazal. A great year for Team Jolokia begins under the sign of diversity and living together!